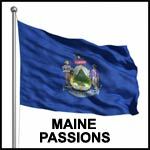 By voting on the books listed, you can help to determine whether a book is related to the theme of Maine Passions, or whether it is a non-related, but popular, book among the members of the site. If you believe a book in the list below is 'on theme' with Maine Passions, vote that it is relevant. (If you don't know, just skip it.) Over time, we hope to have a library of books that should be of interest to Maine Passions members. This book offers an in-depth look at the beliefs and practices centered on the shaman, a person believed to have powers to heal and communicate with the spirit world. It is therefore strongly in their interest to assist us in transforming the earth into something better. This book shows us how to learn from and enjoy them in a most delightful way. Native American Healing introduces readers to the healing modalities and rituals arising from the traditions of the Lakota Sioux, grounded in concepts of harmony and oneness with the Earth.